The last time I did a "Featured Dish" post (St. Ali's incredible Bo Peep! ), I said I'd be trying to do one every Monday - and that was four weeks ago! Whoops! As I'm sure you've gathered, this past month has seen me blog less frequently than I usually like to: moving house meant three whole weeks without proper internet, there was that little trip to Sydney, and I started my new job. It's been CRAY-CRAY! Now I'm settling into my new routine, I finally have the time for many more blogposts, and I'm looking forward to getting back to my usual blogging levels. Yay! CURRYWURST! I'm sure all my fellow Germany-enthusiasts would be just as excited as I was to find currywurst available for sale! I know it's easy enough to make at home - all you need is a good quality German sausage, oven chips or bread, tomato sauce and curry powder - but it's all part of the experience to buy one from a stand and eat it out of a cardboard tray on a cold day! Now, I had no idea that Snag Stand sold Currywurst when I visited - It was a freezing cold and rainy day, I wanted a quick lunch and thought a sausage would do the trick. (That's what she said!) I made my way to Snag Stand and, and spent a good amount of time staring vacantly at the menu and trying to decide between a German Bratwurst and a Swiss Bratwurst. The German hot dog had the virtue of being, well, German, and the Swiss Bratwurst comes with sauerkraut on a poppyseed roll - yummm. The Swiss Bratwurst won out in the end, but when I walked up to the counter to order, I saw, hidden behind the glass, a sign for Currywurst! (Circled in the picture below!) And my mind was swiftly made up for me. 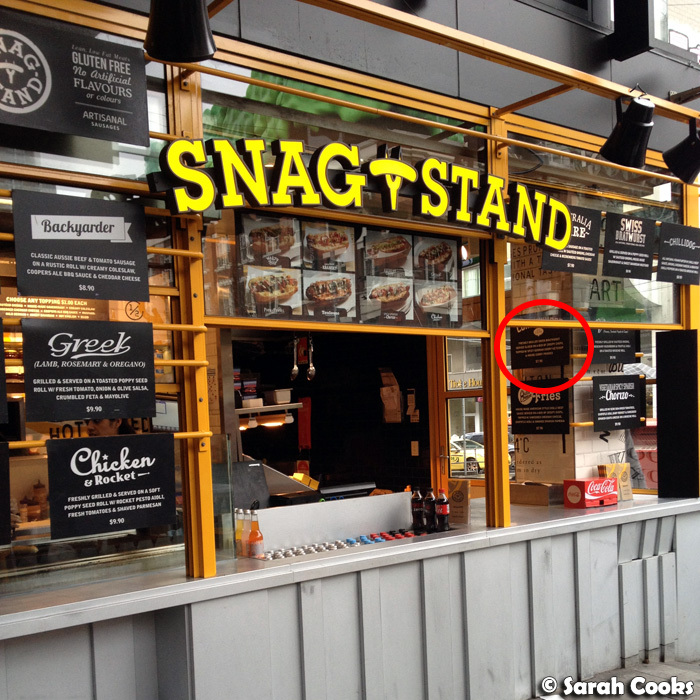 Snag Stand, Melbourne Central, with the Currywurst sign circled - why so hidden away? Obviously, I loved it, primarily for the novelty of being able to buy Currywurst here, but it tasted good too! I thought the sausage itself was of high quality and very tasty. The Currywurst seemed very inauthentic though, with Aussie-style thick cut chips, and not nearly as much ketchup as the Currywursts I've had in Germany. (See my Berlin 2006 post for an example!) However, I do think that Germans (and West Europeans in general) have a higher tolerance for sauce-soaked foods than we do. It was, surprisingly, incredibly spicy (i.e. the level of heat you'd normally find in Szechuan noodle soups like Dan Dan Mien), rather than having that mild curry flavour that seems so popular in Germany. I love hot food, so I was happy with this, but unless you really, really like very hot food, you might struggle. I wonder if this was intentional or a mistake? Either way, I liked it! Apparently you can also request curry ketchup on normal hot dogs (i.e. 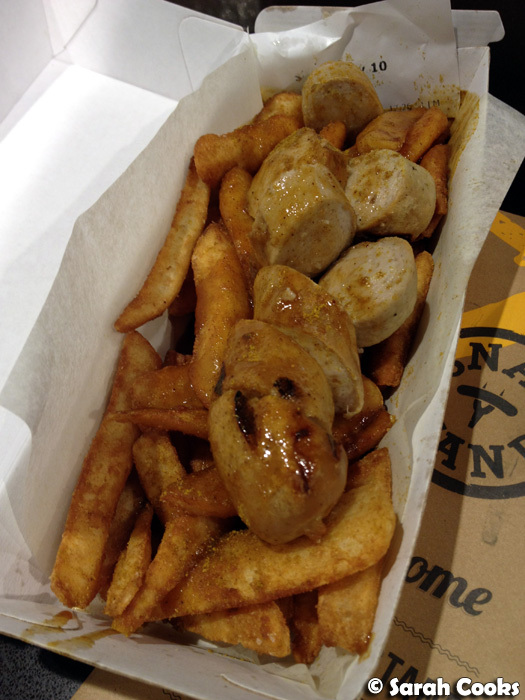 the ones with buns), not just as part of the Currywurst, so get to it! I am totally with you on the currywurst! I was SO excited when I saw they had it at Snag Stand. Fond memories of my exchange in Dusseldorf...fond memories! 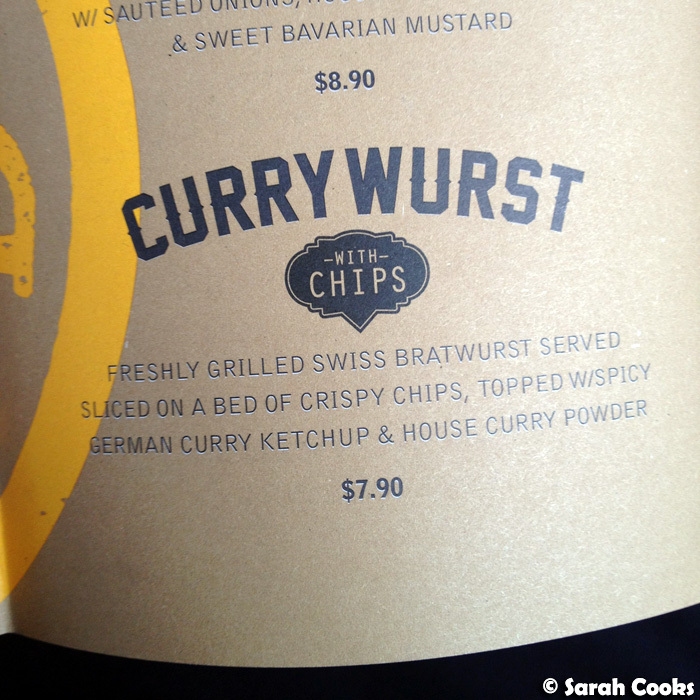 I had this and the moment I first saw it, I knew it wasn't currywurst and it was crap. I had the chance of having the real deal in Berlin and Stuttgart on my travels.